Another industry that Bangkok is known for is having hand tailored clothes made on the cheap. While I don't have a need for many suits, I do enjoy a nicely fitted shirt and pants. If you've ever met me, you'll probably quickly notice my 6 foot, 4 inch (193 centimeter) body that is even further punctuated by a lankly body type. I often got the string bean comment during my younger years. The biggest issue I have when finding shirts is that I need a large or extra large so that they are long enough but that is too much fabric around the waist. I feel like I'm wearing a tent. I've found a good shirt size at Banana Republic but it's still too short in the waist. When I got the opportunity to have good hand tailored clothes made for a reasonable price, I jumped on it. 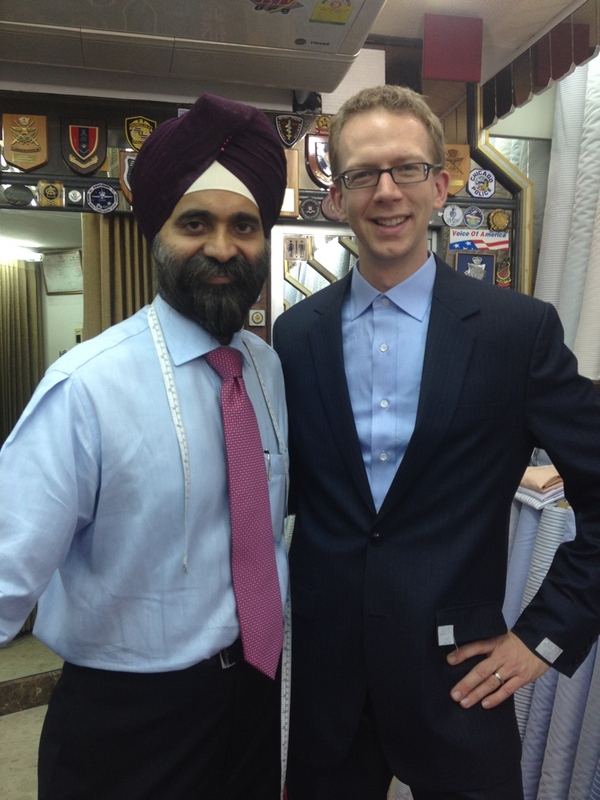 I got fortunate in that I didn't need to do a lot of research to find a tailor. An employee of my client recommended someone that she used when she was in Bangkok for a college trip. I lucked out in that his store wasn't too far from my office. It was only two BTS SkyTrain stations away plus about a two block walk. So with only 3 weeks left of my trip, off to Raja's Fashions I went! Walking into the store front you immediately see suit and slack fabric on your left and shirt fabric on your right. The middle is overflowing racks of completed tailored clothing. The store had Bobby and his father working with customers in getting measurements or fitting rough cut suits. There was also 4 or 5 females helping customers pick fabrics. The place was small but busy. Stepping in the first thing I was asked wasn't what kind of suit I wanted or how many pairs of pants I could buy. It was "what would you like to drink? Cocktail, Beer, Soda, Water?" 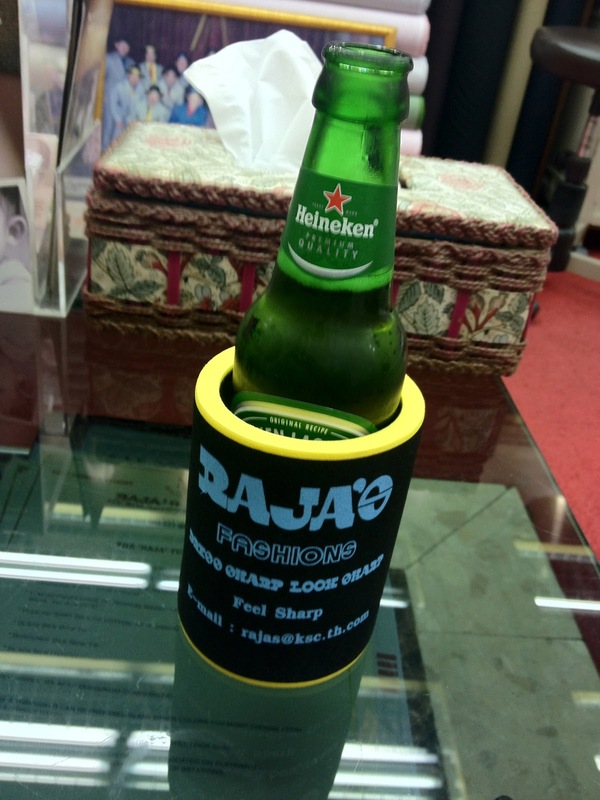 Before I knew it I had a beer sitting in front of me and about 15 books of suit fabric samples. One of my Thai friends came with me, Pom, and she helped me go through the books. I let her know what kind of fabric I wanted and we went to it. As it turns out, I ended up going with the sticking with the very first fabric I looked at in the very first book. We flipped through some style books to pick out the style of suit that I wanted. Before I knew it, I was being fitted. Bobby did the measuring himself. While he spoke fluent English, he rattled off my measurements in Thai. He was quick and determined at getting the measurements and his assistant wrote the numbers down in a leather-bound book. It is actually quite amazing that he keeps track of this information in these booklets. In fact, there wasn't a single computer in sight at the store. I ordered a package deal that gave me a suit, tie, and 4 shirts. I was then charged with figuring out the fabrics for the shirts. Before I knew it I was done and handing over 5,000 baht as my deposit (~$166). Bobby requested that I return in 5 days for a rough fitting. I don't know for sure how long it took, but it felt like 45 minutes from entering the store to leave. I will say that I left that fitting feeling somewhat frustrated with myself because I didn't do any negotiating. I decided that the price he gave me was worth it to me but there's always leaving something on the table that didn't need to be. It's similar to finishing a race with plenty of energy in the tank. Who knows what would have happened if I tried. I might not have gotten anywhere. I returned on a Tuesday for the rough fitting and it was a similar process in that I was offered a drink but I needed to get back to the office as soon as possible so I was hoping for a quick fitting. My pants looked to be 90% done and one of my four shirts was ready to try on. Everything fit quite well and I tried on the suit jacket, which still had plenty of work to go. He asked me to come back in three days for the final fitting. The night before I had talked to TKB about picking up the suit and she recommend I consider getting some slacks. When I was trying on the suit for the final time, I noticed my current slacks were starting to look worn so Bobby set me up with 4 slacks. When we talked about it, I did try to negotiate with him about throwing in a shirt or whatever. We chatted for a minute and he wouldn't budge. When I resigned to go with his price, another customer, a westerner, in the shop commented that he was looking forward to see if I could work out some sort of deal because Bobby didn't relent on Hillary Clinton when she worked him for a discount. Well, that made me feel somewhat better! 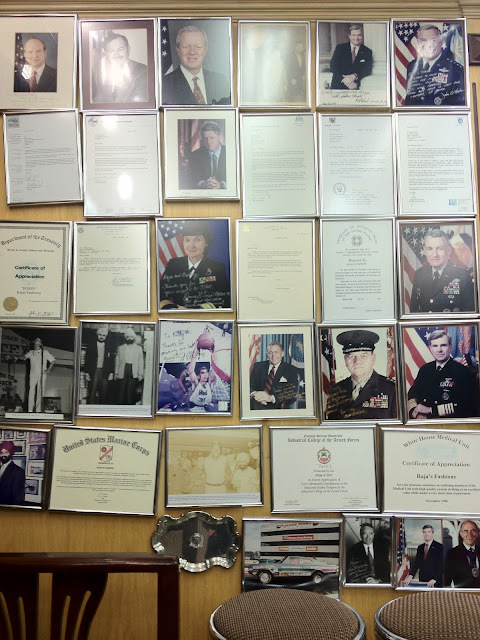 The skeptical person I am makes me wondered if he was just saying that to make me feel better; however, Bobby's shop is full of autographed photos and letters of appreciation from military personnel. Yes, there is a signed photo from Bill Clinton in there. Maybe it is the truth! So in three days he had made 4 slacks! Very quick but I could have probably gotten them sooner if I really needed. It worked perfectly because I picked them up the day before I left for home. I was quite pleased with everything from the process to the packaging. On my way out I asked Bobby about future orders. He said he would send me swatches in the mail to the US and since he already had my measurements, could make something and ship it to me... all via email. I'll take it! When I think about what I paid and what I got I am pleased. 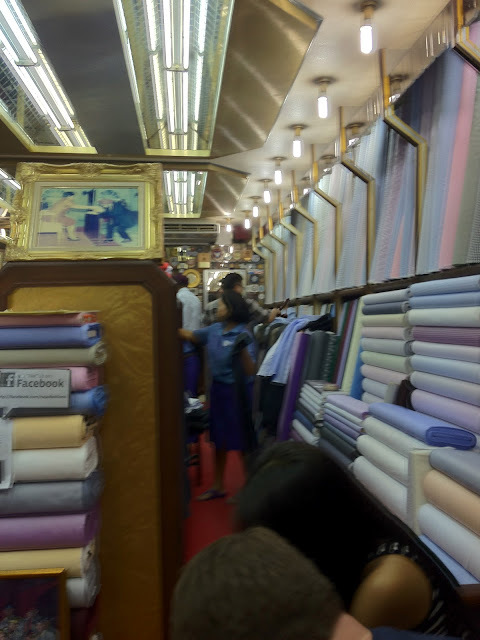 Thinking about my frustration with myself goes back to the fact that you can walk up and down Sukhumvit and you'll find tailors on every street block. Many of which have signs out to have a suit made for $150. I paid more than 3 times that much for a suit, four shirts, and a tie. One thing thing though is that those same stores are always empty and there is usually someone out front barking at you to come inside. Bobby's shop was ALWAYS busy. Usually two people being measured, someone trying on clothes and one, two or more people waiting to be helped. I think I'd rather spend more money for reputable, quality clothes. In addition, I was in Halls at Crown Center a couple weeks after my trip to pickup some cuff-links. The gentleman who was helping me mentioned that in August and February they produce fitted, hand tailored shirts. He mentioned that prices were between $100 - $150 per shirt. Bobby's price is easily 1/4 of that. My plan for now is to put these clothes in my work attire rotation over the next four to six months and see how they last. More people from my company will be making this 2 month long trip in the future so I might have some more shirts/slacks ordered and hand delivered back to me!!! So, if you want a handmade suit. Buy a plane ticket to Bangkok and schedule a week long vacation. You will spend less on that trip + the suit than if you were to go to a tailor in the United States. Bobby's shop is moving and will actually be more convenient for customers. He is current down a side street that can be hard to find. He's moving his shop that will be right off the Nana BTS station instead of a couple blocks from it. Keep checking his website for location and information on the move. The location can be found in the bottom business card in the image above.